Mia Cancun Resort is the ideal place to enjoy paradise. Located along the beautiful beach in Cancun, close to the best shopping, clubs and restaurants, Hotel Bacaratte has been designed in the style of traditional Mexican mansions but with a contemporary twist. The luxury and privacy you live during your stay is very exclusive, thanks to offer only 27 rooms and suites filled with amenities with unique details, since no two rooms are identical and each guest experiences the sensation of being in a secret corner Mexican Caribbean in a private and exclusive environment. Mia Cancun Resort is considered a first-class boutique hotel as it provides an ideal experience to get away from the everyday in the quietness of the beautiful Mexican beaches. Its peaceful environment, quiet, decorated with elegant furniture in its architecture and very Mexican blend perfectly with the services, comforts and luxuries of modern life. ts location has been privileged with direct access to a beautiful beach in Cancun that allows guests to fully enjoy the stunning turquoise waters and soft sands of beautiful Caribbean tones. Furthermore, Mia Cancun Resort has a beautiful tiled pool placed by hand, with fountains and waterfalls that give an exquisite touch of tranquility. Additionally you can enjoy the pleasure of sharing great moments in the bar, located not far from the white sands of Cancun's most beautiful beach. Mia Cancun Resort offers unsurpassed benefits for your stay in your holiday in Mexican beaches, as it is very close to the best clubs fashion and most important commercial centers of the city. Mia Cancun is an intimate, unique and charming hotel that combines a sober and elegant Mexican architecture, with 27 apartment-style suites in the heart of the Hotel Zone in Cancun, Mexico. This hotel offers personalized service in the intimate and private atmosphere of a Mexican residence on the beach. Mexican handcrafts and decoration make each of its spacious suites unique. Ideal for honeymooners, family trips and romantic getaways, the suites feature a relaxed atmosphere, magnificent beaches and the most romantic views of the Caribbean Sea. Complimentary wireless Internet access is offered. Beach towels and umbrellas are provided, and guests can relax in the complimentary beach cabanas or on the terrace. Located at Km 11.5 very close to major entertainment centers, malls, nightclubs, golf courses and only 20 minutes from Cancun International Airport. A place where you will enjoy the turquoise blue waters and white sand. You will live the feeling of an architectural style in an authentic Mexican Hacienda, where you will discover the unique pool with handmade tiles and waterfalls framing the beautiful beach. Our 27 rooms, include suites and a penthouse, have been designed in the style of an ancient Hacienda, each one has a different decor allowing a unique experience. In the suites you will enjoy the jacuzzi on the terrace. Some of them have a spectacular ocean view and others have Nichupte lagoon view where you can enjoy the unforgettable sunsets. 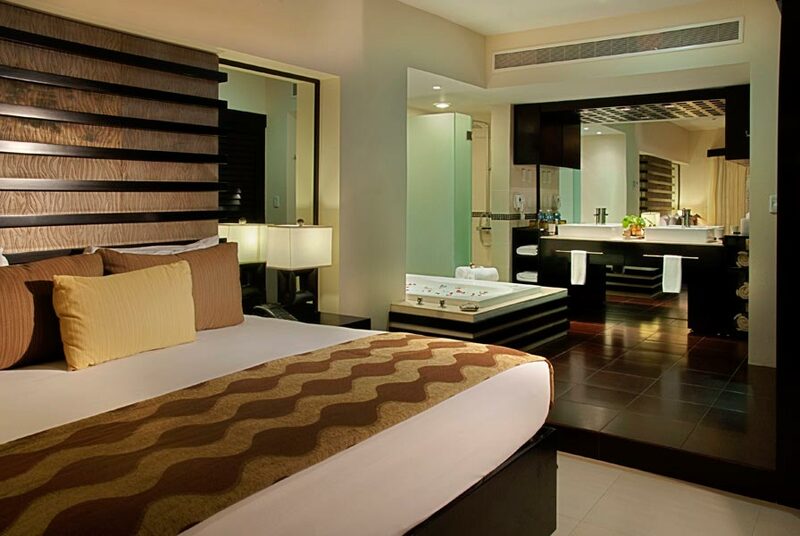 Also rooms are equipped with the best available services to make your stay a pleasant one. Restaurant "Las Marias" with sea view: Menu Mexican specialties as main dish of the house and an additional variety. Available for breakfast, lunch and dinner. You can order your dinner and enjoy a beautiful view accompanied by the sea breeze. To spend all day peacefully at the pool or on the edge of the beach, there is as accompanied enjoy drinks and snacks in the house lying on the lounge chairs or in the soft sand. A small, comfortable bar in the hotel lobby, to enjoy and relax with a cool drink in hand, connected to social networks or talking with family. Wi-fi in the hotel lobby.